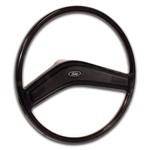 Are you tired of having armstrong steering? Maybe you're afraid to drive the Bronco because the stock manual steering is so worn out you can hardly keep the thing on the road. You might have even tried a rebuilt manual box but you found it has as much play as the old one you turned in for a core. Could be it's time to make that Bronco drive the way you always wanted it to by converting to power steering. We know our customers use their rigs in many different ways, therefore, we offer a number of different P/S systems so that you can pick the system best suited for your Bronco. No matter what the terrain, we have a system for you. 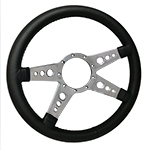 See our Steering Tech Pages below. My steering wheel has excessive play. What can I do about it? I'm doing a restore on a 1973 Bronco that vibrates like a space shuttle during take-off.